By most measures, mobility is lower in more recent periods (1995–2005) than in the late seventies and the eighties (the 1977–1987 or 1981–1991 periods). Comparing results based on pre-government income suggests that an increasingly redistributive tax and transfer system contributed to rising mobility into the 1980s, but that its impact has since waned. Overall, the evidence indicates that over the 1969-to-2006 time span, family income mobility across the distribution decreased, families’ later-year incomes increasingly depended on their starting place, and the distribution of families’ lifetime incomes became less equal. Jared suspects that these things are correlated. I suspect he’s right. “The relationship between income concentration and political power is one important link,” he says. In other words, more income concentration among the rich has given them more political clout, and that’s allowed them to influence public policy in ways that encourage even more income concentration among the rich. I’d add to that another dynamic: as the poor increasingly stay poor, the public starts to view them not as victims of larger trends, but as a permanent underclass that’s not willing to work hard enough to better themselves. And who wants to see their tax dollars spent to support a bunch of shiftless layabouts? The chart below tells the main story. 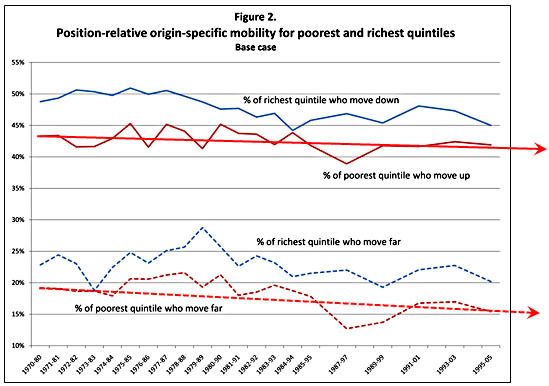 The number of poor families who move up at all has decreased over the past 35 years, and the number who have moved up more than trivially has decreased even more. The American Dream isn’t what it used to be.